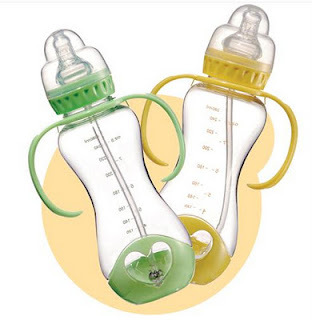 Baby & Health- Is Feeding Bottles Safe? Before you panic, know that government health officials don't believe that the amount of BPA in baby bottles and other consumer products is dangerous. After reviewing research on the plastic, the FDA stated that based on its ongoing review it believes the amounts of bisphenol A that find their way into food and drinks are too low to cause any real health effects in humans. However, the agency is continuing to look into the question of BPA safety, and for now, the issue remains unresolved. Although the jury is still out on bisphenol A, if you want to avoid any bottles that contain it, look for the #7 recycling symbol or "PC" on the bottom. That's usually a sign that the bottle contains BPA. However, not all plastics labeled with #7 recycling code contain BPA. Some bottle brands, such as Born Free, explicitly say that their products are not made of Bisphenol A. Even if you're concerned about bisphenol A, you don't have to give up your plastic bottles. Non-polycarbonate plastic versions are available. They're made of polyethylene (#1, #2, or #4 recycling symbols) or polypropylene (#5 recycling symbol). Non-polycarbonate plastics are also options when your child graduates to a sippy cup. 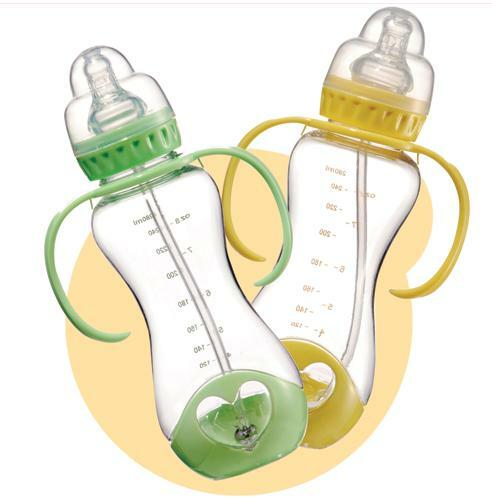 · Never store breast milk or formula in plastic bottles. Pour it into the bottle just before your baby is ready to eat. Throw out anything that is left over. · Heat and wear can both increase the rate at which BPA leaches out of the plastic. Heat polycarbonate bottles in warm water (not boiling), rather than in the microwave. Microwaves should also be avoided because of the risk of burning baby's mouth. Throw out any polycarbonate bottles that are scratched or cracked. · Don't use hot water or a harsh cleaner on polycarbonate bottles because this also can cause the plastic to break down more quickly. Instead, use a gentle cleaner and warm water. · Replace any glass bottles that have cracks or chips in them.